If you’re looking for the best Black and Decker Leaf Blower for your needs (and budget) then we think you’ll appreciate our Black & Decker leaf blower buying guide. In this article we also introduce the LSW60C — an innovative 60V Black and Decker Leaf Blower that has been engineered for the needs of homeowners in mind. Black and Decker has been around since 1910 so when it comes to power tools they know what they’re doing. Summer is upon us and this means we’ll be spending more time in the garden. It’s time to haul out the garden equipment and get things in tip-top shape, ready for the joy of outdoor fun. This spring, Black and Decker has released their brand new Black and Decker LSW60C 60V Blower. It’s their most powerful and sophisticated leaf blower yet. Black and Decker is to power tools, what Ford is to motoring. It may not be the most prestigious brand name on the market but it is known to offer exceptional dependability at an affordable price. It’s been more than a century since S Duncan Black and Alonzo G Decker first launched their machine shop in Baltimore in 1910. Since then, Black and Decker tools and appliances have become a common sight in most homes, not just in the US, but around the world. Power is the name of the game with a 60V (nominal 54V) motor driving an axial fan. This gives the Black and Decker LSW60C 60V blower an air volume capability of 400 CFM at a speed of 100 MPH. When you encounter stubborn debris that won’t budge, you can press down on the power boost button to give you the extra power that you need. What’s more, the tip of the blower pipe has a steel scraper that allows you to loosen even the toughest build-up of debris. Using the 9.7 LBS blower is made easy and comfortable with an ergonomically designed, soft-grip handle. A trigger power control is conveniently placed toward the front of the handle, with the power boost button on top. So with a press of your thumb, you can increase the power when needed. As with any battery operated tool, you want to know how much time you have available. To make things easier, the Black and Decker LSW60C 60V Blower has a built-in battery charge indicator. This means that you can see, at a glance, how much battery power you have left. It hasn’t been on the market for very long, so there hasn’t been much feedback from users. What we can determine from those who’ve used it this far, is that it’s a great tool with a longer battery life and people have commented on how quietly it operates. The best blower that Black and Decker offers. So far, so good. It seems that the Decker LSW60C 60V Blower could well be this summer’s winner in the leaf blower category. When it comes to dependable quality, the name Black and Decker says a lot and it’s backed by a 3-year warranty. The only real problem with battery operated tools is the limited battery life. The best way to prevent this from becoming an inconvenience is to buy extra batteries. Having 3 batteries is ideal and should give you plenty of working time while charging the standby batteries. Of course, this can become expensive if you have many different tools that use different batteries. This is why it’s a really good idea to buy a range of tools that all use the same battery. Not only are you going to save money on batteries, but you won’t end up with a heap of different chargers and batteries cluttering up your home. Having all your tools using the same battery makes it all the more worthwhile purchasing an extra battery or two. So if the Black and Decker LSW60C 60V leaf blower seems like a good idea, you may want to consider adding other 60V Black and Decker garden tools to your collection. Perhaps not immediately, but as they need replacing. Let’s see what other options you have that use the same Black and Decker 60V battery. 60V MAX cordless hedge trimmer powers through jams with POWERCUT. Comfortable handle design with soft grip zones makes it easy to hold. State of charge indicator shows battery charge level. Ample power with a whole lot of versatility. The 24” dual-action blade gives you good reach and its low-vibration design makes working with the trimmer an absolute pleasure. In addition to this, the wrap-around auxiliary handle makes it easy to use both vertically and horizontally. When you need some extra power to cut through tougher situations, the POWERCUT function is available at the touch of a button. To make even lighter work of thick branches it also has a saw blade that will cut through 1½” branches with ease. It uses the same 60V battery that is used in the Black and Decker LSW60C 60V leaf blower and also has a built-in battery charge indicator. It also comes with the Black and Decker 3-year warranty. So if you want to add to your Black and Decker range of 60V garden tools, this would be the hedge trimmer to go for. Two 2.5 Ah – 60V MAX* Lithium batteries give you twice the runtime per re-charge. What could be more convenient than a battery powered lawn mower? Well, the Black and Decker CM2060C lawn mower is the ideal solution if you want the quiet running and low maintenance benefits of an electric mower without the hassle of dragging a cord around with you. The smart technology used in the Black and Decker CM2060C lawn mower really maximizes the working time that you get from the battery. The AUTOSENSE power management system conserves battery power and gives you additional power when needed. With this technology, you will be able to mow a ¼ acre lawn without running out of battery power. What’s more, you get two 60V batteries and the simple POWERSWAP system allows you to swap the batteries with the touch of a button. This is the ultimate in user-friendly design. It has six height settings that are easy to adjust between 1½” and 4”. It also has a 3-in-1 configuration that gives you the option to mulch lawn clippings, bag them or expel them to the side. The Black and Decker CM2060C lawn mower is super easy to store, not only do you not have to worry about winding up an electric cord but the handle folds away easily to make it more compact. The mower has a 20” cutting path, so you can cover a large area quite easily. It is designed to be ideal for yards of around ⅓ of an acre. With more batteries, there is virtually no limit to what size lawn the mower can handle. This really is a must-have item if you’re going to go for Black and Decker’s range of 60V garden tools. Like the others, it has a battery indicator and also comes with a 3-year warranty. 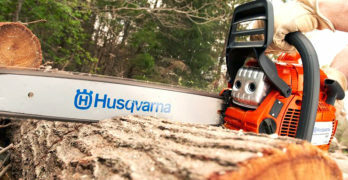 Perform clean, fast cuts with POWER DRIVE – high-torque transmission. Dual 0.080” Line EASYFEED lets you quickly and reliably feed trimmer line with the push of a button. Perform clean, fast cuts with the POWER DRIVE high-torque transmission to give you cutting power at the string. Save time and hassle by quickly flipping from trimmer to edger and back. There’s a lot of great technology crammed into this string trimmer. The EASYFEED system allows you to feed the 0.08” line effortlessly. It uses a push-button to feed the cutting line which makes it really hassle free. Power is enhanced by the POWER DRIVE transmission that increases torque at the cutting string. Including two power settings, gives you the option of increasing battery life or you can make use of the higher power setting when it’s needed. The handle height is simple to adjust so you can work comfortably with minimal effort. To make the Black and Decker LST560C string trimmer even more versatile, it can switch from being an edger to trimmer by simply flipping the machine. What could be more convenient? With this complete range of 60V garden tools, you have no reason to stress about keeping the garden neat and tidy this summer. If you have the complete range with enough spare batteries, you’ll be able to complete all your gardening tasks with the least amount of effort and never run out of battery power. Something that is well worth considering which, in the end, will save you both time and money. There are people who won’t see the need to pay extra for more power and longer battery life. If you’re looking for a smaller leaf blower for general household and garden use, perhaps Black and Decker’s older, lower voltage models would be a more attractive option. Lightweight and straightforward to use. This is a handy compact blower for multi-purpose uses around the garden, home or workshop. For many people, the lightweight design will be a distinct advantage. The Black and Decker LSW221 20V Blower weighs only 3.7 LBS and is extremely quiet. There are no specifications for the air volume, but you can be sure that it’s substantially lower than the larger more powerful models. It does, however, have a very impressive air speed – 130 MPH. The 20V 1.5AH battery gives a reasonable amount of working time and it’s able to hold the charge for up to 18 months. If you’re already using other 20V Black and Decker tools, this one might be a nice addition to your collection and you can share batteries between them. The Black and Decker LSW221 20V has a 2-year limited warranty. While not as impressive as the new 60V range, that has a 3-year warranty, this is still better than the average 1-year warranty offered by many other manufacturers. It’s a really great compact blower to use for smaller tasks, though it may not be the best for cleaning up larger yard areas. Ultra-lightweight at only 4.7 lbs. Larger and more powerful than the 20V blower, the 40V Black and Decker LSW36 makes a good alternative for larger tasks. Despite the extra power, it’s not particularly heavy, weighing only 4.7 LBS. Again there are no specs for the air volume and the speed is 120MPH. Given that this is a more powerful machine with a lower airspeed than the smaller 20V model, you can expect a much better air volume (CFM) figure for this one. Among the many great features of the Black and Decker LSW36 is a built in scraper to help loosen hard debris and an ergonomically designed soft grip handle. Another great advantage is the Fast Charger that will charge the 40V battery in as little as 90 minutes. To make it easier to extend battery time, the POWERCOMMAND system lets you choose whether you want higher power or longer battery life. Like the larger 60V tools, this one also has a battery charge indicator. The Black and Decker LSW36 makes a perfect middle ground between the more powerful and expensive 60V model and the smaller 20V one. It has the same 3-year warranty as the 60V range of tools. Learn more about Black & Decker products by visiting their site. To help you make an informed decision, let’s take a broader look at other leaf blowers and how they compare. There’s a large variety out there, so you can choose which leaf blower works best for you. Designed for light-duty yard cleaning tasks. Enhanced power and run time with the new G-MAX Lithium-Ion batteries. Variable-speed motor provides price application speeds up to 150 MPH. Extension tube helps increase reach and blower efficiency. Lightweight design provides easier control over the unit. Cushioned over-mold grip increases operator comfort. Ideal for light to medium duty clean up tasks. The GreenWorks G-MAX 40V range is extensive, with over 25 tools to choose from. This means that you can have a full range of tools that all operate using the same 40V battery. A big advantage of the GreenWorks 24252 G-MAX 40V is that it’s a vacuum and blower. It has a bag attachment that allows you to vacuum garden debris and mulch it for composting. This is a powerful machine with a boost button to give you more power when you need to remove wet leaves or more compacted debris. It has an air volume capacity of 340 CFM with a speed of up to 185 MPH. Power is controlled by use of variable trigger which is conveniently placed on the front easy-grip handle. 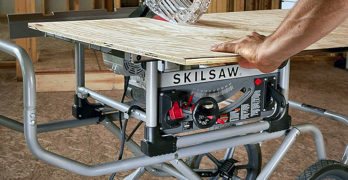 This is one of two handles that make it easy to use the 3.3-pound blower. Users have commented on how easy and comfortable it is to use and the handle set-up is one of the best. Another plus that users have commented on is the good battery time – almost 30 minutes at full power. The blower comes with an impressive 4-year warranty and the 40V 2AH battery has a 2-year warranty. Can run up to 75-minutes. A great blower for the price. The turbine fan, inspired by the design of jet engines offers exceptional power with whilst being very energy efficient. All of this contained in a weather resistant design. It has three speed settings, a switch allows you to choose between an energy saving 250 CFM or high power 385 CFM capacity. For when you need an extra boost, a well-positioned thumb operated push button will pump up the power to an astounding 485 CFM. This makes it an easy to use comfortable and powerful leaf blower. The 56V lithium-ion battery comes in many variations. There’s a 2 AH standard battery, you also have the option of a 2.5 AH battery which will give you an extended battery life and there are more battery options, all the way up to 7AH. This can be of great benefit for people looking for more working time from a single charge. The 56V range of EGO Power+ tools is quite extensive and even includes a chainsaw. The good range of products and great battery design make this a good contender among the high-powered battery tools. Run time of up to 40-minutes with a 2Ah battery. Innovative speed control maintains desired airflow of up to 550 CFM /130mph. Stable anti-tip base design allows you to place the blower on a level surface and prevents it from tipping over. Comfortable, ergonomic rubber handle and touch-points. Easy push button starting with indicator light to let you know the blower is powered on. Tube Bump/Scrape Protection : Metal tube end ring protects blower tube from bumps and scrapes when working. The Snapper XD uses the Briggs and Stratton 82V lithium-ion battery which not only gives great power but this battery is also used in a lot of other tools from various brands. This is a big plus when giving you a variety of options for tools that use the same battery. The rapid battery charger also adds convenience with shorter charge times. There are two battery options, you can get a 2 AH battery or step up to a 4 AH version for a longer working time. The blower has great power – 550 CFM at 130 MPH. It is also has a steel tip on the blower pipe. So, like the Black and Decker LSW60C 60V blower, you are able to scrape away hard or compacted debris. The infinite trigger control gives you full control over the power setting, through a finger controlled trigger placed in the handle. Many will find comfort in the fact that this blower has a 5-year limited warranty. This is the best of all the blowers we’ve looked at in this review. Learn more by reading our in-depth review of the Snapper XD SXDBL82. A high-quality battery leaf blower with an impressive level of reliability. ✓ View or download the MANUAL for the GreenWorks Pro 80V blower (GBL80300). 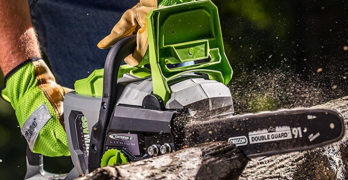 The GreenWorks Pro 80V range has a good selection of high powered garden tools which include a mower, string trimmer, hedge cutter and chain saw. It offers fantastic battery life, with a choice of batteries ranging from 2AH up to 5AH. At low speed, you can get up to 70 minutes from the 2AH battery. If power is what you’re looking for, this blower won’t disappoint you, it has a capacity of 500 CFM at a speed of 125 MPH. This is controlled via a three speed trigger switch. It has a comfortable single handle. Though, for some, the 8.9 LBS weight may be a bit hefty. Wonderfully designed for long-term use. It is exceptionally quiet for a machine this powerful at only 60 dB. All around, a very impressive machine with a 4-year warranty and 2-year warranty on the battery. Is the Black and Decker 60V blower right for you? Or the GreenWorks 80V? or…. With so many options it may not be that easy to make a decision. First, you need to ask what you’re going to be using the blower for. The lower powered, lightweight blowers are ideal for multi-purpose tasks like cleaning dust and debris from the home, garage or workshop. They are, however, more limited when it comes to larger yards. If you want a blower that is going to make life easier around the garden and allow you to cover a larger area in less time, go for a more powerful model. It’s very important to have a good look at what other tools are in the same range and use the same the battery. The benefits of sharing batteries between tools have already been pointed out, but it should be stressed how important this is. If you’re planning on using a number of battery powered tools, you’re going to save a lot by using the same battery for all of them. Effective blowing power : 423 CFM of air volume at 129 MPH. In this article, we’ve covered the Black and Decker 60V range in some detail. This is because they are brand new and, up until now, you’ve probably known little to nothing about them. So it seemed fair to inform you a little more about them in order for you to make an objective decision when comparing them to the other models that have been around for some time. If you’re looking at getting a leaf blower, think carefully about what other battery garden tools you may be wanting, now or in the future. Take the time to compare all the tools in the range offered by a manufacturer to those offered by any of the others that you’re interested in. Spending that extra time now will make things a whole lot easier further down the line. Once you’ve chosen a brand, stick with it so that you will always be using the same battery.